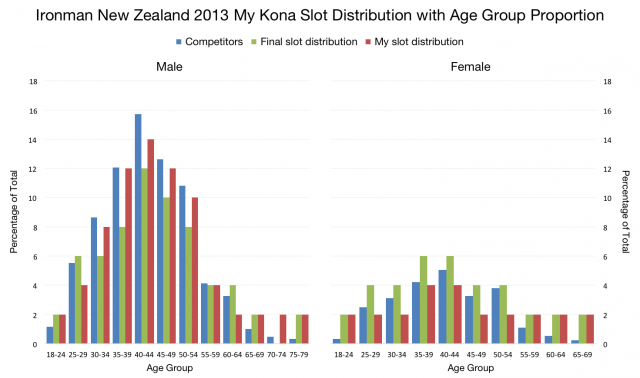 How are Kona Slots Allocated? If you go to the Hawaii Qualification section of next week’s Ironman Los Cabos website you will find instructions for the allocation of Kona slots to age groups. 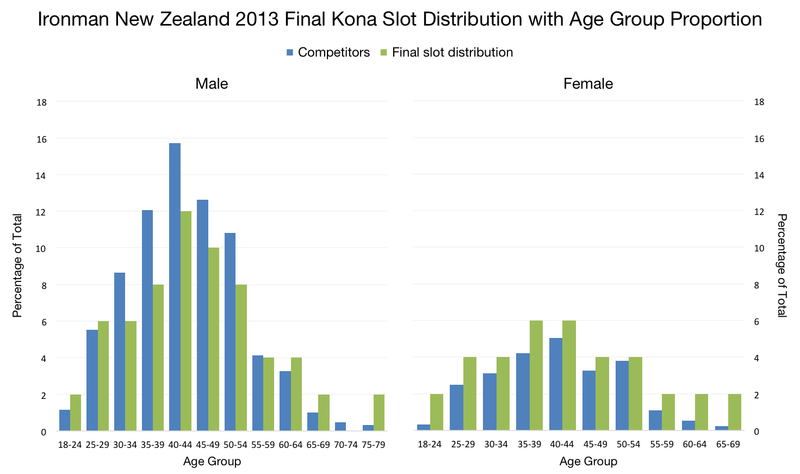 You can read them there, but fundamentally slots are allocated in proportion to age group size with a minimum of one slot per category. Sounds simple, but replicating this process in software so that I can predict slot allocations for future races, such as Los Cabos, has proved much harder than anticipated. I started playing with ideas earlier in the week, New Zealand was my test bad having recently imported all its Kona qualification data into the Ironman database. I trialled different solutions in Excel and after a morning with the numbers had a method that fairly distributed all slots with a minimum of one, but required tweaking for each race and, more importantly, didn’t match New Zealand’s allocations. It was a solution, just not the solution, and I’d reached the limits of my Excel skills. The Los Cabos guidelines gives an example that if 8% of the Age Group starters are Female 40-44, then 8% of the slots are allocated to the Female 40-44 category, but if I compared the distribution of slots in New Zealand 2013 to the distribution of athletes in Age Groups, as in the graph above, the match was poor. I wondered if the actual allocation process was, at least in part, manual with race organisers adjusting the allocations by hand to make their numbers work. That, or I was missing something obvious. Allowing for the fact the figures above include a couple of age group roll downs (male and female 70-74 slots rolled to other age groups) the allocation tends to underrepresent the largest age groups and overrepresent the smallest. I can see some sense in that – it helps prevent the major male age groups taking all the slots. I was still interested to see if I could come up with a better distribution, either closer to the actual numbers or more accurately proportional to the age groups. I tried several methods – you can skip this paragraph if you’re not interested in the more technical details – all based upon the principle of calculating the number of age groupers per slot and then assigning slots to age groups based on this number. For example, at Ironman New Zealand 2013 there were 1,284 age groupers on the start line and 50 slots giving 25.7 age groupers per slot, so in the male 40-44 age group with 202 members there’s potentially room for 7.86 slots. By assigning slots in rounds, giving one to each age group with space from largest to smallest, I ensured each age group took a fair share. Refinement brought the numbers closer to the actual proportions, but the approach I finally settled on assigned each age group a number of slots proportional to its size and then iteratively adjusted the distribution until the correct total number of slots were allocated. The results are shown below. My allocation doesn’t match the final slot distribution, but it more closely matches the competitor distribution. I’m no nearer to replicating the methods used by Ironman, but if they are at the organiser’s discretion I may never be. 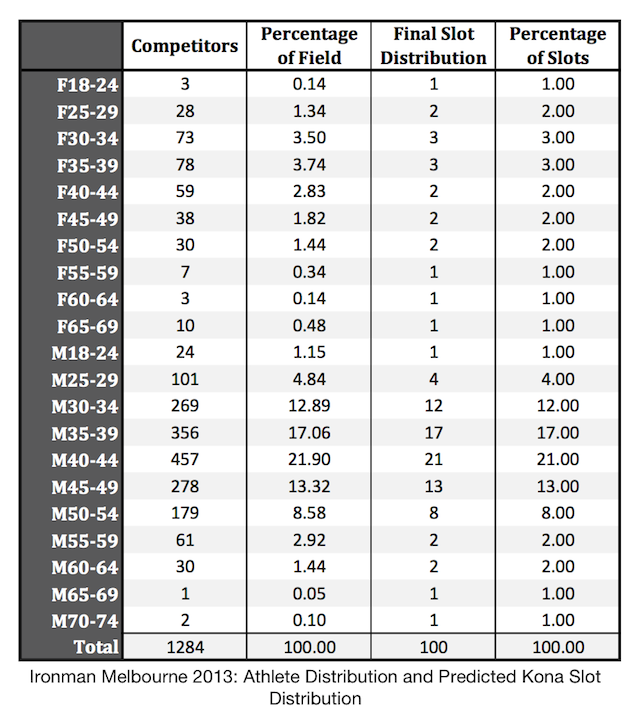 What I have is a means to estimate future distributions, such as Ironman Melbourne below, on the basis of athlete numbers. We’ll see how my predictions stand in two week’s time. 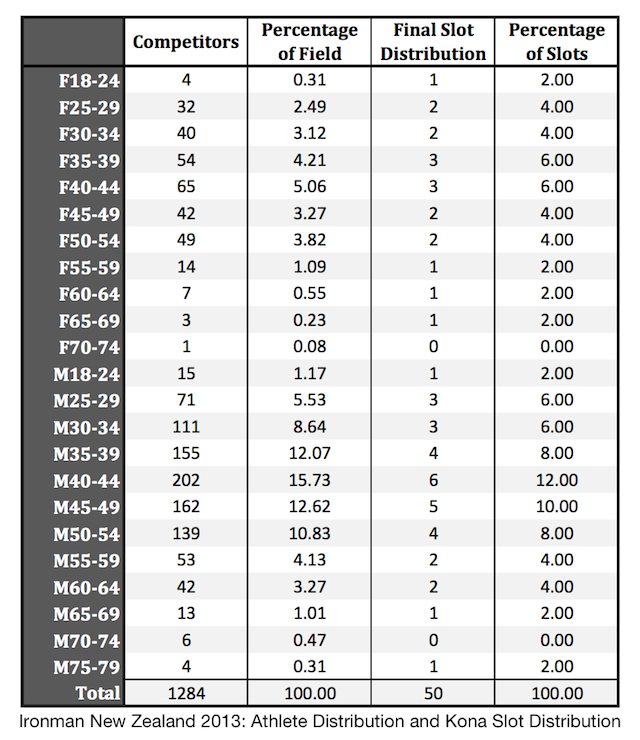 With more slots to distribute they’re likely to be more accurate, but we can anticipate the largest groups having fewer slots and some of the smallest groups having more. Whatever method Ironman uses their actual distributions don’t seem to match the precise wording of their allocation policy, but I still can’t help thinking I’ve missed something obvious.